Batsman Alex Hales is determined to be more than just a one-day specialist for Nottinghamshire this summer. The England Twenty20 opener was dropped from the club's Championship team with three games remaining last summer after averaging just 14 from 18 innings. "Obviously last year didn't go to plan in the four-day format," the 25-year-old told BBC Radio Nottingham. "But I've had a lot of time away from the game, time to assess and think about where I'm at." 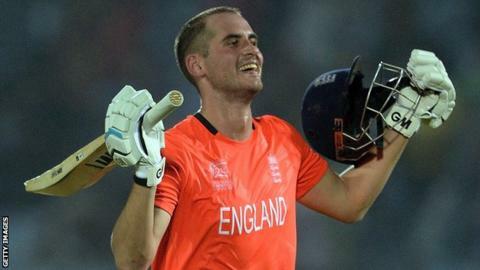 Hales added: "It's been refreshing, so I'm looking forward to getting going, trying to reclaim my spot in the team and I'm desperate to score a thousand runs again as I did in 2011." Nottinghamshire begin their Championship Division One campaign at home to Lancashire on Sunday, with four subsequent four-day games to follow before the arrival of white-ball cricket in mid-May. And Hales says having a consistent spell in the four-day game will give him the chance to get back to his best. "It will help having that block of four-day cricket where I can put all my attention into it," he said. "In the past few seasons, there's been a four-day game followed by a one-day game, and a couple of T20 games here and there, so you don't really know where your mind is at some of the time. "There's a lot of cricket in the English season, so it'll be nice to have the five four-day games straight away. It'll give me a good chance to focus on my technique and get it right for that aspect of the game." Hales spent the winter with the Adelaide Strikers in Australia's Big Bash tournament, before joining the England squad for the tour of the West Indies. And he went on to put his name in the history books by scoring England's first Twenty20 international century against Sri Lanka at the World T20 in Bangladesh. Despite not playing four-day cricket since last September, Hales said he feels fully prepared for the start of the English season. "It's been nice to dust off some of the cobwebs as I haven't faced the red ball in a few months, but it's good training with Mick [Newell] and Wayne [Noon] so I'll be working closely with them over the next few weeks," he added. "As a club we want to challenge for the title. Division One is as strong as it's ever been, with some quality overseas players and very strong teams. "But on a personal level I want to secure my spot in this team again. I'm feeling refreshed and I'm ready to go."